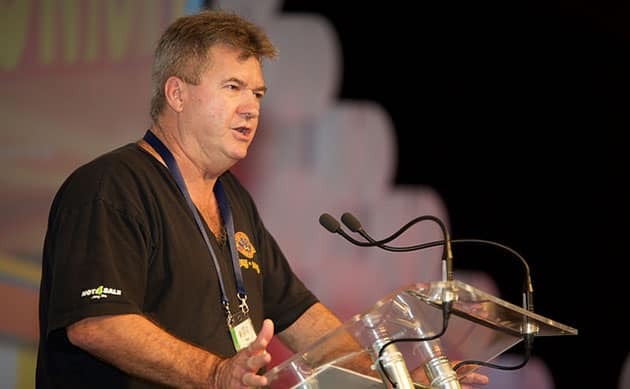 Peter Simpson is the Queensland State Secretary of the Electrical Trades Union (ETU). His union led campaigns against privatisation against both Anna Bligh’s Queensland Labor government and Campbell Newman’s Liberal National state government. In 2011 he was expelled from the Labor Party when his union began discussing moves to run anti-privatisation candidates against Labor at the state election. He was subsequently re-admitted. The union’s Victorian branch has made several large donations to The Greens. He spoke to Solidarity about The Greens’ decision to work with the Liberals to pass Senate voting reform, despite the risk this would allow Malcolm Turnbull to go to a double dissolution election and give him more chance of passing the ABCC legislation. Turnbull has now re-called parliament, attempting to blackmail the cross-bench Senators into supporting the Australian Building and Construction Commission (ABCC) bill and the anti-union Registered Organisations bill, or face a double dissolution election where many of them will likely lose their seats. What has the union’s relationship with The Greens been like in the past? We’ve had an excellent relationship with The Greens. We’ve backed them financially, we caucused with them and lobbied them on occasions. Our people have been able to go and talk to their people, especially our Victorian branch, in particular with Adam Bandt who’s been very good, and who we are still working with despite what’s happened. What do you think about their decision to vote for Senate reform, knowing it makes the chance of the Liberals passing the ABCC and the Registered Organisations bill more likely? It’s dumb politics and that’s what really gets up my nose. We weren’t asking them not to do it [vote for Senate reform], that’s their policy and they want that outcome. All we asked them to do was wait, and not just us, the ACTU and everyone else, to put it off until May 12 until they voted on it, to take the [prospect of a] double dissolution out of it. But they went ahead and did it and guess what, we’re heading for a double dissolution. Everyone in the union movement who had anything to do with the ABCC told them. We knew what the government was going to do and this was impressed upon The Greens. They were lobbied, they were texted, they were phoned, emailed, written to. They denied it, they said it wouldn’t happen. Well it did happen. I’ve got a very dim view of the new leadership of The Greens, I think they’ve lurched to the right. I think Di Natale could fit very well into the front bench of the Liberal Party and I’ve got no time for him whatsoever. Why is the ABCC such a big deal for the union movement? The ABCC issue’s important to our members. I was talking to our Victorian branch secretary the other day and there are over 50 clauses that would be automatically knocked out under the code [for building industry enterprise agreements]. So that’s at least 50 conditions and allowances and rights that our members have fought for and won to get in their agreements over the last 100 years that are going to be knocked out by this code. When Labor got back into power last time they said that anything you can negotiate with an employer, we’ve not going to stop you from doing it. Our guys fight for conditions, fight for wages, fight for rights and the stroke of a pen can undo that. The Greens are against it, I get that it’s not their policy to see that come in, but by virtue of their actions they are helping the government. That sickens me. How has this affected your attitude towards The Greens? I haven’t got a relationship with them now and that’s sad. I’ve had a relationship with The Greens for many years and I’ve copped criticism from the Labor Party for backing The Greens, on occasions publicly supporting The Greens. But I make no apologies for that because they actually said the right thing and followed it up. The new leadership and new direction The Greens seem to have taken themselves in, siding with the Tories, it’s going to be a very rocky road I’d suggest from here on, not just with our union but with quite a few. problem with that is what exactly ? He is answerable to his membership. If Anne could just explain why the electoral reform was more pressing than defeating the ABCC legislation , but she makes no attempt to . There wasn’t an issue with the greens policy on electoral reform , but I am confident no one will get hurt in their workplace if it was delayed, the same can’t be said about the ABCC. A real assessment of the damage this has done will be noticed long after the next election & the greens I believe will regret this short sighted opportunism. Oh , & I am a green voter !